Réforme de la loi relative aux associations : une menace sur la liberté associative ? 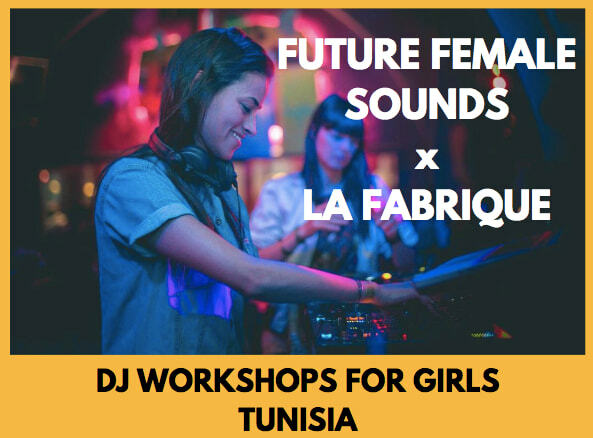 In the occasion of the international women’s day la fabrique in partnership with Future Female Sounds organized a one-week DJ workshop for women in Tunisia. 12 Tunisian participants had the chance to take part of an intensive DJ course including Intro to Djing,Learning how to mix music, preparing and practicing a live performance and Self-promotion. DJ Workshop for Girls is the first Academy encouraging women to enter to the Djing labor in the Mena region. Yet, this is not a first for Future Female Sounds which is a non-profit organization and a social enterprise promoting young female musical talent, based in Copenhagen, Denmark. Future Female Sounds functions as a talent incubator highlighting female DJs, through DJ workshops, cultural management masterclasses, and preparing them to work with sounds in the future. La fabrique – Coworking Studio is a program launched by the association Notre Culture D’abord to promote young musicians and support their musical creation. It is a coworking space dedicated to musicians for rehearsals and live recording. The DJ Workshop for la fabrique is not a first as well initiating three Djing sessions in the last year with tunisian female DJs. The Academy lasted for a week and was closed March the 8th 2019 by a party where the participants performed a 10 minutes sets celebrating the international women’s day with 10 rising female DJs giving a fresh and a new feminist perception to this labor.